Welcome to another installment of Crunchy Mama’s Wild Food Adventures! I am pleased to present one of my favorite summer wild edibles: purslane (Portulaca oleracea)! I noticed purslane last year in my organic veggie garden. It was prolific (because we had put an irrigation system in). Once I found out that it was edible, I tried it and I really enjoyed eating it. It is a mild-tasting, very slightly lemony, succulent vegetable that happens to be grown outside of the U.S., on purpose, to be eaten as one of the most nutritious vegetables around. In the U.S., most folks call it a weed. An acquaintence of mine mentioned that she developed an allergy to purslane. So, I am going to give a variation of the warning that just about every wild food blogger (teacher, etc.) gives to his/her audience: Whenever you eat a food that you have never eaten before, you should only have a little so that you can see how your body reacts to the new food. Additionally, you really should get solid confirmation from several reputable sources that the plant that you’d like to eat is what you think it is. I often take videos and photos of plants that I am unsure of and post them in wild edibles forums such as the forum at Eat the Weeds and several wild edible Facebook groups. According John Kallas, purslane is extremely high in omega-3 fatty acids, vitamin E, and glutathione (140). Other sources say it is high in vitamin A and C. If you grow it on purpose, it is drought-tolerant once established. Because it contains mucilage, it is very soothing to mucus membranes in your digestive system. Other foods and medicinal plants that contain mucilage are: okra, slippery elm, marsh mallow (not the white sticky sweet treat), chia seeds, flax seeds, and aloe. Here blogger Meghan Telpner writes about the health benefits of mucilaginous foods. Here is a video by YouTube user thejourneyoutdoors in which he shows purslane and a toxic look-alike which he calls spurge. After digging around to find out the scientific name for the toxic plant, I found out that it is Euphorbia maculata (or prostrate spurge). 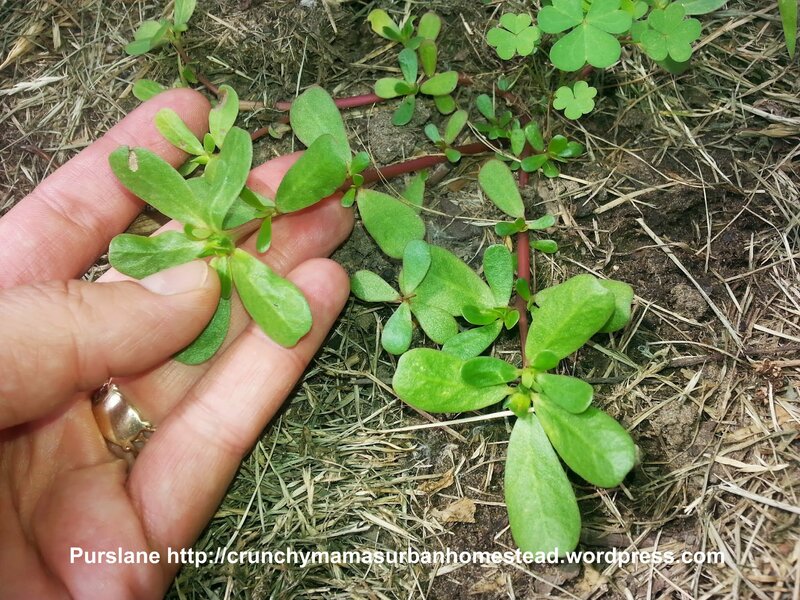 The biggest help to find out if a plant is spurge or purslane is if it has a milky sap. Purslane has clear liquid inside. Here is a video that I made in which I show another purslane look-alike. I am pretty sure that it is prostrate pigweed or mat amaranth (Amaranthus blitoides). Here are a few more videos on purslane by fellow YouTubers. I have only eaten it raw in salads or just as-is when I am working in the garden. However, I have read from several sources that you can cook it with other things and it will thicken the dish in the same way that okra would thicken a dish. This is because it is mucilaginous. The mucilage is released when it is cooked. Amaranthus blitoides images — this plant is not toxic; I’ve read from some sources that they are edible but I have no experience with preparing and consuming them. Identification: The stems are smooth and red and the leaves are spatulate-shaped and thick. The leaves grow directed from the red stems, usually in clusters. The leaves have a glittery sheen to them (as compared to a clear shininess on A. blitoides — see my video for comparison). The leaf veins are subdued, probably because it is a succulent plant. This is a sprawling plant (meaning it grows along the ground instead of upward). Time of Year: Purslane likes hot weather. Environment: It will thrive in moist, fertile soil but it is drought tolerant. It likes plenty of sunshine. Method of preparation: You can eat the stems, leaves, flowers and seeds (but not the root). Eat them raw or cooked. Thanks for reading. If you enjoyed this post, please click the “LIKE” button and consider subscribing via email, Twitter , Pinterest or your favorite reader. P.S. more resources are listed below. http://www.minnesotawildflowers.info/flower/spotted-spurge (“Commonly there is a faint to prominent red splotch mid-leaf, but not always. Stems are up to 16 inches long, typically prostrate but occasionally ascending some, sparsely to densely hairy, often reddish colored, branching frequently, forming large circular mats.”) That it is hairy is a big clue that it is NOT purslane. Wow! That’s a lot of information on purslane and its look-alikes! Better to have more information than not enough when it comes to wild edibles.